Not too many people believe that my dad’s mother was the inspiration for the Darth Vader character in Star Wars. But my historical research proves this to be true. There was a period of her life when she was seduced by the dark side. It began when she gave birth to my dad, and reached its zenith during his early teens. At times, the comparison was startling. Her cape-like dark robe, the hair style and night cream which resembled the famous Vader headgear, and even her voice (“I am your mother!) resonated with a James Earl Jones heart-stopping sonic boom. She was highly trained in the use of The Force. She could point her finger at my dad’s throat and choke off any verbal protestations. When Dad would say he’d have his chores done by noon, she would somberly intone, “Pray that you do.” And her skills and dexterity wielding a mop or broom as she virtually floated from room to room was an obvious harbinger to Vader’s talents with a light saber. When she was too busy in galactic matters to mete out routine discipline, she would call on a storm trooper (my dad’s father) to do her bidding. But like Vader, she eventually abandoned the dark side (when, coincidentally, my dad’s rebel alliance matured). She began using The Force against evil, spent years traveling the galaxy on diplomatic and recreational missions, and is now a nonagenarian residing at Chewbacca’s Home for Wrinkled Wookiees. I talk with her by phone now and then. Her once sharp mind has been blunted by a lifetime of interacting with my dad, so she rarely remembers my name. She has referred to me as Flagstaff, Fleabag, Flophouse, Fast Track, Flab Sack and Pancake. But I don’t mind. I know I am talking with a legend, and because I am now living with her son, I can relate to her battle scars and cognitive decline. Now I’m channel surfing between an old Star Wars movie and a college baseball game between North Carolina and Duke. And because my dad’s mother has rubbed off on me, I’ll probably later only remember watching something called The Umpire Strikes Back. Use The Force, Duke!! 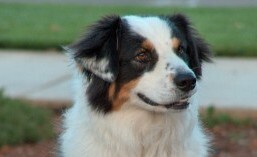 This entry was tagged aussie, australian shepherd, blog, chewbacca, darth vader, dogs, humor, star wars. Bookmark the permalink.